As discussed in the first part of this article, perceived risk is a necessary part of play when it comes to commercial playground equipment. Without it, children become bored and lack the opportunities to test themselves and grow. This is where dynamic playground equipment like rope-based games come into play. By offering free, unstructured play on a fluid material, we at Dynamo Playgrounds provide children with opportunities to have unique experiences while playing and climbing on the equipment. When children encounter a 20+ foot net, they feel challenged. They look at it and might think, “That’s pretty high”, or “This is hard to climb with other kids on it”, but when they eventually work towards reaching the top, there is an intense feeling of satisfaction. They may scale it on the first attempt, or they may need to come back a few times, climbing a bit higher each time until they reach the top. Even though our equipment can look intimidating, everything that we are creating is compliant to the strictest safety standards. Any real hazards are removed in the design process; and what remains is the challenge we get from perceived risk. This encourages children and teens to test their limits, push themselves further and grow as people with fit bodies and fit minds. 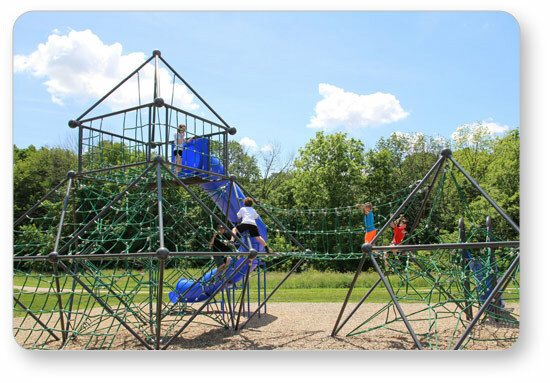 Interested in adding some challenge and excitement to your next playground? Reach out to our team at Dynamo Playgrounds, and let’s build something great together!